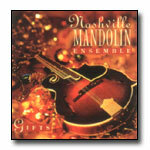 The Nashville Mandolin Ensemble embodies a musical spirit that swept across America in the late 1800's and early 1900's, but the NME's music is anything but a nostalgic re-creation of an old-time art form. It's more like a discovery of a lost treasure. The unique sounds of a mandolin group--the pure, bell-like tones and delicate, delineated scale passages; the warm, emotional waves of an ensemble tremolo--are as new, as exciting and as relevant to today's music as they were when American audiences first heard them a century ago.